A tooth with an infected pulp (nerve) can be saved. The root canal is cleaned and disinfected. A sterile filling is placed to seal the canal. If necessary the tooth is strengthened before the final filling is placed. 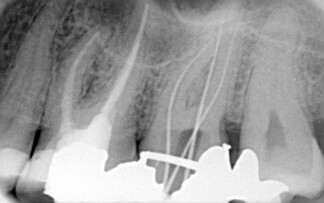 Strengthening of the tooth before the final filling is placed. Take prescribed pain killers before the anaesthetic wears off, usually every 4 hours, to minimize any pain.